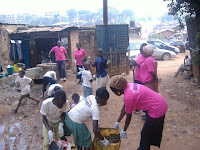 On Saturday 19th January, volunteers and children from all different KCK centres and people from the local community gave up their time and energy to help to clean up Katanga slum. 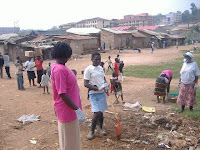 Katanga is a large slum situated in the heart of Kampala near the University and the Hospital but it is almost unnoticed by those who walk past. 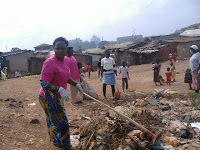 Life in Katanga is extremely hard – people live in very overcrowded conditions and sanitation is poor. Many families often survive on just one meal per day and cannot afford to send their children to school. 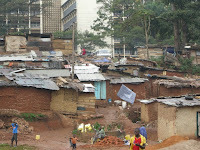 Disease and illness is rife, and Katanga is notorious for crime and violence at night. 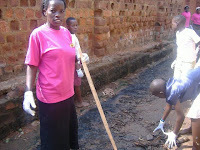 Many Ugandans have never been there and people often walk the long way around it in order to avoid the dirt, the people and the open sewers. 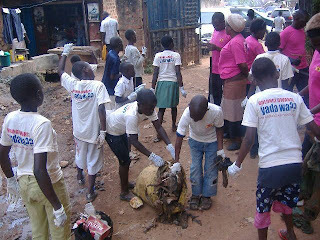 We decided to help clean up Katanga slum to not only help the people who live there practically and also to talk to them about the importance of good hygiene and keeping clean, but also to show the people and community of Katanga that we love them and we want to serve them. Volunteers picked up litter, cleaned out the stream, dug ditches, cleared walkways, and generally cleaned and tidied up the area. This day really meant a lot to the people of Katanga and the community, the volunteers and the children really enjoyed themselves and appreciated the day. 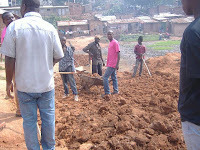 But this was just one day and there is still so much need in Katanga and a lot more we would like to do to help. Katanga has numerous problems with sanitation, housing, space, tenure security, employment and security – these things can’t be fixed in a day but please join us in prayer for this community. 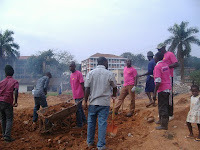 If you would like to support or just get in touch then please email us info@kidsclubkampala.org. Thank you. Newer PostHelp our children play on their field!